So are you looking for a nice read to cap off your summer? Or maybe you want something to cozy up with in the winter, with a nice mug of cocoa. 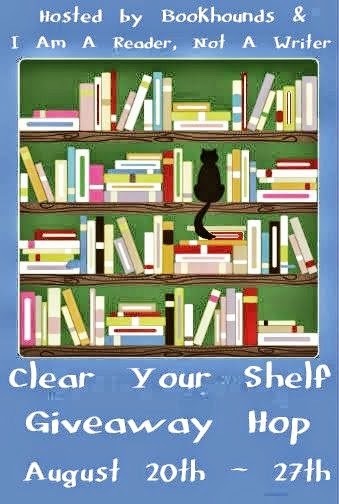 Bookhounds & I Am a Reader, Not a Writer is hosting their Clear Your Shelf Giveaway hop, and I'm joining in! And Broken Harbor holds memories for Scorcher. Seeing the case on the news sends his sister Dina off the rails again, and she’s resurrecting something that Scorcher thought he had tightly under control: what happened to their family one summer at Broken Harbor,back when they were children. Note: Even though this is technically the fourth book in the series, you don't need to have read the other three to follow it. My book recommendation is Hopeless by Colleen Hoover! My book recommendation is Nest by Esther Ehrlich. It comes out next month and it's one of my FAVORITE reads this year! I read Off Season by Anne Rivers Siddons, it was a good book, she writes very well, but the end was a crusher I tell you! I just finished it last night! I would suggest Outlander by Diana Gabaldon or The Night Circus by Erin Morgenstern!! I recommend The Cuckoo's Calling by Robert Galbraith (JK Rowling's pseudonym). I have been re-reading Agatha Christie this summer. Currently I am re-reading Murder on the Orient Express. She is a great story teller! I would like to recommend Stones Data by Jacob Whaler. Yay! I haven't read In the Woods yet, but I hear she's a fantastic author! I would recommend the Lincoln Rhyme series by Jeffrey Deaver. Just finished The Sleepwalker's Guide to Dancing. It's pretty thick and there's a lot to think about. I really liked it. I just read The Vacationers, but didn't feel there was much substance. It was a quick read, though. On the flip side, before that I read The Goldfinch, which was packed with messages about beauty and depression but was looooong. I think the best book I've read this summer was What Alice Forgot. I just finished Dead Out by Jon McGoran, and it was really good. Thanks for having this giveaway. I just finished reading Ruin & Rising by Leigh Bardugo and I really liked it!!! I would recommend Creep by Jennifer Hillier. I loved it and am reading the sequel, Freak, now. Thanks for the giveaway and super-easy entry. I've been wanting to read Tana French. She said Yes has ALWAYS been my favorite. The Lovely Bones by Alice Sebold was pretty good. I am new to your blog so its hard to tell yet what you might like. I'm new to your blog as well. If you like great mysteries, read anything by Robert B. Parker. Be sure NOT to read anything written by those picking up the pen and writing AS him after his death. Their work is nothing like Parker's. Robert B. Parker was a man who knew how to cut a sentence down to the bare necessities and make it work. Recommended: anything by Richard Yates, in particular Revolutionary Road and Disturbing the Peace. I also would recommend Agatha Christie. My favorite character is Miss Marple. My recommendation would be Jane Eyre by Charlotte Bronte. That is my favorite book in the entire world! Also, anything by Ellen Hopkins! Under the Boardwalk by Barbara Cool Lee was a very enjoyable read. I'd recommend Outlander by Diana Gabaldon and Riding the Rap by Elmore Lenoard. My book recommendation is Sanctuary of Nine Dragons by Chris Weigand.